On iPhone using Safari, and these ads are redirecting me to various sites including cam girls. It only happens here, gamefaqs.com, and politico.com for me—no other sites—so whatever ad network you guys are using has a shady ad that needs to be reported. Last edited by Breakfast with Girls; 08-10-16 at 09:08 AM. Thanks Breakfast! I'll get this reported. Were you on mobile skin or full? And was it an automatic redirect, without clicking on anything? Great, thanks. Mobile and automatic redirect. b2net, Thanks for the info. I'll add this to the tech ticket. Always helps to have more evidence! I hardly use the mobile skin (also iOS) due to frequent redirecting. Would anyone happen to notice which ads that are on the page when this occurs? Can someone post pics of said "cam girls"? P.S. I'm a mod and want to get right to the bottom of this. why you no like our cam girls? ^ Mine redirects me to Korean bobblehead spam. Oh wait, that's the full browser version. I have been getting that for a while here. The site it redirects to is luckyyou.mobi, which is about winning some prize. Also on chrome for mobile in android. I got hit with one of those last week; I also had to kill the browser to clear it. Just had 3 more in a row on TV Talk. This is getting GD out of hand. I get hit with the same when using the site on my Kindle Fire. Never have this issue on my laptop. Why does this pop up on iPhone on this site? Oldboy, I merged your post with this thread. Seems to be on the same topic. I get the crappy redirects too on both Android and iPhone. Also getting the redirects Oldboy posted. Seemed more common on the random image thread in Otter. 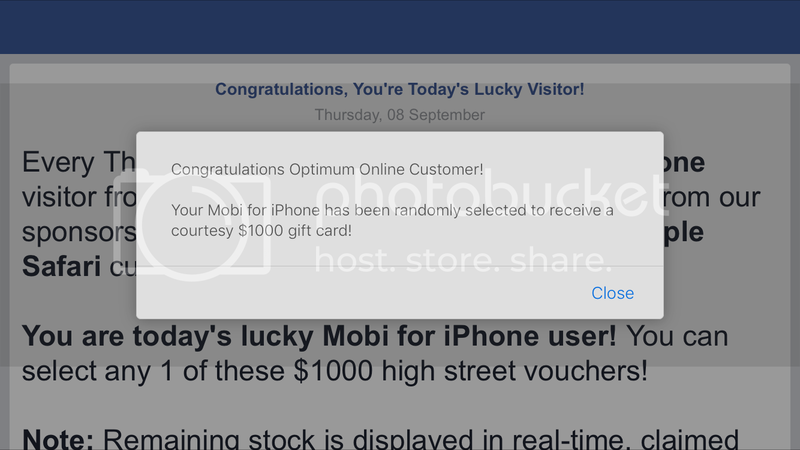 I've been experiencing issues lately when using the website on my iPhone where I'll constantly get redirected to a page telling me that I've won some sort of prize. It's been happening a lot lately over the past week or so and is really irritating as I pretty much have to constantly close the tab and open a new one but even then a lot of times it'll still happen. I have pop ups blocked on Safari on my phone but it's still a pretty consistent issue. This is the only website I regularly frequent where this happens. Just wondering if anyone else is experiencing the same thing? Edit: it just happened again after I posted this thread. Irritating as hell. Add me to the list. Happening on my iPhone and iPad. I have not tried switching to the desktop site. Our tech guys are on this. They've managed to replicate it (I couldn't) and are currently working on resolving it.